Charlotte’s Community Survey Panel was founded by the UNC Charlotte Urban Institute, the Ph.D. in Public Policy Program, the Department of Political Science and Public Administration, and the Policy Opinion, Learning and Sentiment Lab, a research laboratory that conducts experimental research to understand factors that influence public opinions on a range of issues. This new initiative will enable city and county citizens to share their thoughts about topics related to their quality of life and/or respond to issues in the news. This high-quality, online survey research platform and regular opportunities for interaction are designed to allow civic organizations, community stakeholders, academics, and policy-makers to learn vital information about perceptions of key issues in the Charlotte area. 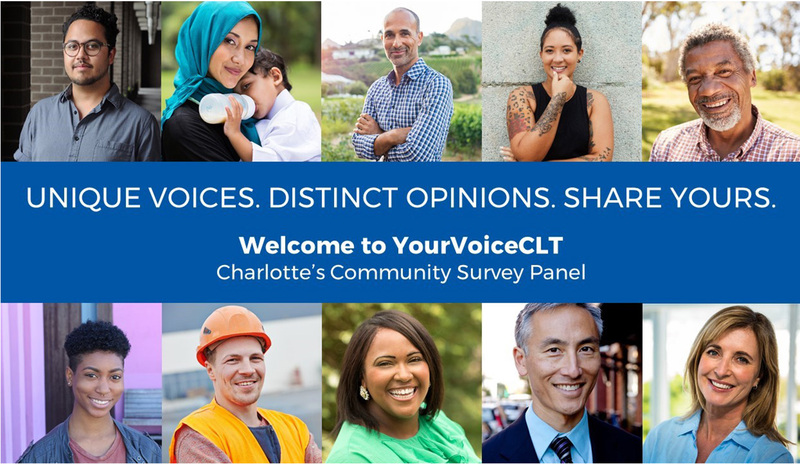 YourVoiceCLT is seeking volunteers who represent the full range of households and opinions in Charlotte to sign up to take surveys throughout the year to help local government and nonprofit and community-focused organizations identify public needs and evaluate the impact of policies and programs. The UNC Charlotte Urban Institute, a nonpartisan applied research and community outreach center, has facilitated representative surveys for more than 30 years. Diane Gavarkavich, director of research services and executive director of YourVoiceCLT, said YourVoiceCLT marks the next generation in this service. She noted this survey panel will broaden access to public opinion data. YourVoiceCLT participants will have their voices heard regularly throughout the year about issues that matter to them. A secure survey website will allow them to access and take surveys at times that are convenient for them. Individuals without internet access can participate by phone or in local public locations. Anyone 18 or older who resides in Mecklenburg County is encouraged to join. More information about the survey panel and how to sign up are online at YourVoiceCLT.org. The YourVoiceCLT team anticipates releasing results from its first survey in late summer or early fall. Direct questions to Gavarkavich at 704-687-1194 or email yourvoiceclt@uncc.edu.